The Best Free Video Converter available right now in the market is the Wondershare Free Video Converter which does a lot more than your usual video converter. Wondershare was established back in 2003, and since then they have gained a lot of expertise in this field and hence they have put together the One Stop solution for your Video Converting needs. It offers most of the features for Free of charges, so you get a lot of value from the free version itself, while the paid version takes things to the next level, making it a full-fledged solution for all your video needs. The WonderShare Free Video Converter completely covers all the video life-cycle that’s from Downloading a video from a certain source from the internet then converting it to a specialized format which we will talk about in a bit. And then editing it and burning it to a DVD to transferring it to your favorite devices. With all these features packed into a single piece of software, the wondershare Free Video Converter is all you need if you want to do basic to intermediate video editing and a fully fledge experience with all the essential and advanced features if you’re going to convert any file into any other format. The interface of the Free Video Convert felt quite intuitive to use and familiar as well, things we’re found where they should be expected without few clicks and navigating around the program was also a breeze, not once it felt that the video converter was not responding, under heavy load. With GPU acceleration making the video converting process a breeze, and you get the highest quality with a highly optimized lossless conversion algorithm that the Free Video Converter uses; you can convert videos from youtube to mp3 and just extract the audio or vice versa. As you can see in the screen-shot above the Video converter analyzes all possible resolutions as well as various types of Audio qualities as well. Also, read How to watch YouTube videos in the background. There’s also an option for batch videos conversion so, you don’t have to load every clip every time, it’s done in a single one click, and the batch process takes from there after you select multiple files to work. 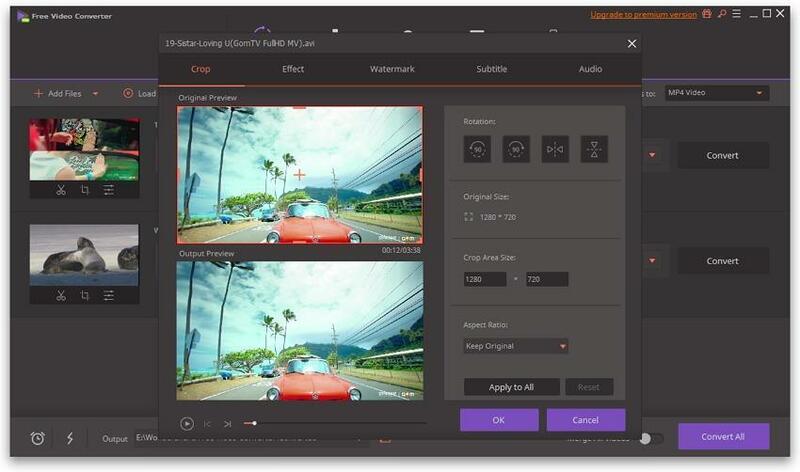 You can even convert videos to Gif, which was highly useful as we have a lot of Facebook marketing to post from after we make that content in after effects so, the wondershare Free Video Converter’s converting power is quite impressive. The free Video converter allows you to Download videos in any format from not only just YouTube but more than 10K websites are supported, to get it all you have to do is just get the URL of your the video you like to Download and paste it within the video converter, and it also offers you choices in what quality you want to download the video. Moreover, you also get to Download the subtitles if they’re available and on top of that, there’s also a High-Speed Download mode this will use your full bandwidth on every Downloading task, and will not bog down like other programs. Multiple download support is also provided here. We downloaded a lot of creative commons stock footage with this program and downloading multiple videos was not an issue, and every single video that was added to the queue was 100% completed, none of them got stuck in the middle, which was a great relief. With the free version you can still achieve a lot of things, but if you want to get the most complete experience with unlimited changes and other actions, you can get the full version and unlock a lot of new features and abilities making it the only app for your Video downloading, converting, editing and exporting needs, thus covering all the aspects of the full life-cycle. One of the essential features that the free video converter has is the screen recording option which is nowadays is of great use if you’re a content creator and use a lot of screen recordings to showcase your tutorials then the Wondershare free Video converter has got you on this front. Editing Video metadata can be changed by going into the Toolbox and choosing the Fix metadata option, from there you can modify various parameters about the media you selected. A video editor is also part of the Free Video Converter suit, and it posses all the essential functions needed to get a basic to intermediate video editing for your normal uploads. Effects such as custom filters and some pre-defined filters make life easy when you want to color correct your converted footage on the go. With the Casting to TV feature baked within the utility tool-box of the program, you can directly cast your creation straight to a big screen for previewing and sharing with your near and dear ones, with just one click, that’s how versatile the Wondershare Free Video Converter is.